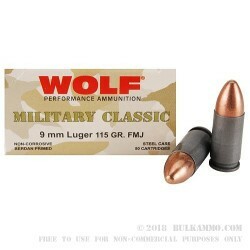 This Wolf ammo delivers inexpensive trigger time for your 9mm Luger pistol without compromising when it comes to accuracy. Each cartridge in this bulk priced case of 1,000 fires a 115 grain bimetal jacketed bullet. Each case contains 20 boxes of 50 rounds each. These cartridges use non-corrosive Berdan primers and non-reloadable steel cases. The steel cases are highly cost-effective and come with a polymer coating that enables them to cycle reliably through semiautomatic firearms. Like most Wolf ammo, these cartridges are made in Russia. The steel components in this ammo may make it unsuitable for use at some indoor ranges due to its magnetic properties.